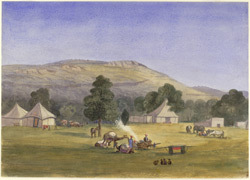 Water-colour painting of a camp under the Kaimur hills (Uttar Pradesh) by Stanley Leighton (1837-1901), December 1868. Inscribed on the mount in pencil is: 'Mr A.R. Pollock's camp, under the Kaimoor hills, Mirzapore.' A. R. Pollock was Collector of Mirzapur, and Leighton accompanied him on a Christmas shoot.